Use the rubric you created and mark the movie My Life As A Zucchini. Then write a paragraph focusing only on the analysis and evaluation section of the longer movie review document (below Assignment # 3). Using the format below, write a longer critique of the movie Moana. After watching Sing mark the movie on the rubric you created and then write a paragraph critiquing the movie. Make sure that you include things you liked and disliked about the movie. 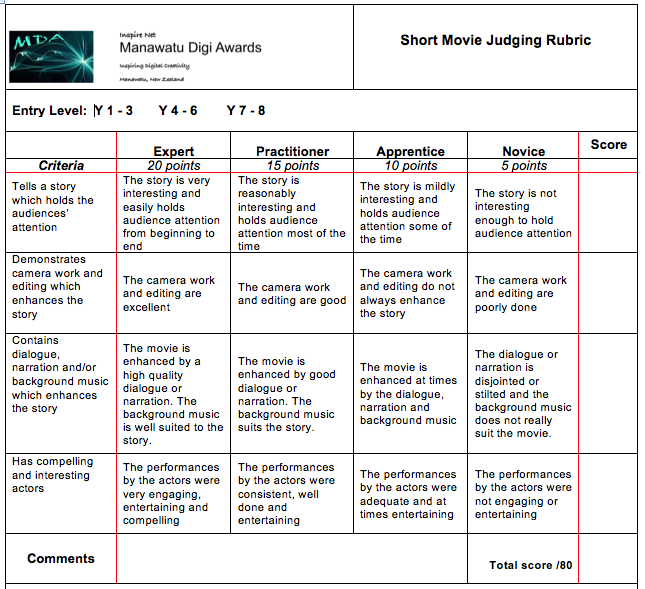 To follow up on the first class, the first assignment will be to independently create a rubric to critique a movie. Once this is done, we will be watching the five animated nominees for the Golden Globes in 2017 and critiquing them. Here is an example. This class is all about movies! Watching movies, assessing and writing about movies and making movies. The first class we will be exploring what makes a good movie. Students will be asked to choose their top 5 favorite movies and identify why. We will then be doing an activity about different genres.